Eagle Street office space is positioned on the edge of the WC1 area of London and is totally unbranded. Transport links are within walking distance to the building offering routes to the City and the West End via the Central line on the underground network. With a generous sized meeting room on the lower ground floor, there are also two kitchen points in the building that are ideal to make tea or coffee. Toilet facilities are on every floor and a lift as well as stairs serves all levels of the property. Within the office suites themselves, business computers and telephone handsets can be literally plugged in to pre-installed IT points and configured by IT support technicians making set up hassle free and simple. 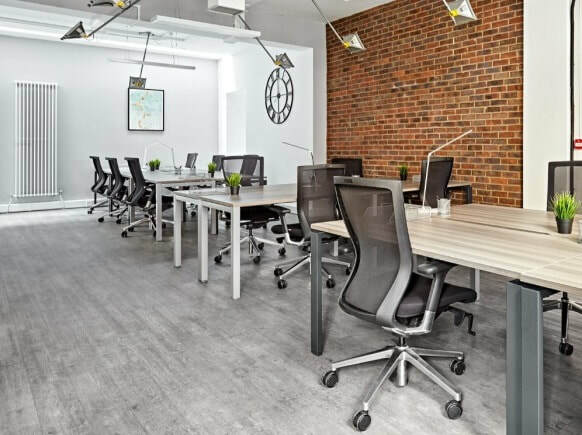 Offices are also fitted out with modern furniture including desks, chairs, and storage drawers. Perfect for short or long-term durations, rent term contracts come in a choice of time periods which start at 2 months and increase up to 12 months.